In the camp we will have 5 sub-camps including the IST sub-camp. 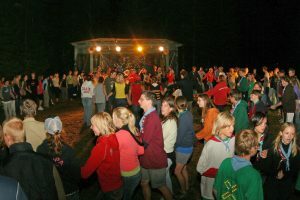 Every sub-camp consists of several sub units. Group leaders will stay in the same sub unit with their group. All participants will accommodate in their own tents. In the camp we offer breakfast, lunch, dinner and one substantial snack time. Dining schedule will be found from the camp’s daily program. There is a cooking team and all the food is prepared in the camp’s kitchen. All participants who need a special menu/diet can report about it in the personal registration sheet. After lunch every day there is open an ice cream KIOSK and also a small Scout-Guide Shop with the post office services. 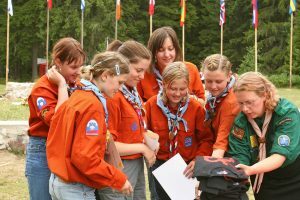 So please take the cash/pocket money with you if you would like to buy any Estonian scouting-guiding patches, stamps or ice cream. For the leaders and ISTs there is also a Forest Cafe open every day where you can get tea or coffee and buy some healthy snacks. On Wednesday 12th of July, while we have the visiting day, the Forest Cafe is open for all the visitors and campers. There are open-air shower booths near the sub-camps and also a small sauna on the camp area, which can be used by the schedule. Showers are using clean unheated river water. Swimming in the river is only allowed in designated areas and with the lifeguard present. In the camp we have a practice to use phones as less as possible and there will be no special place for charging the phones for the campers. For leaders there will be a charging spot in the Forest Cafe. The charging place is operating at your own risk. The bed time in the camp is from 23:00 in the evening until 08:00 in the morning. “Bed time” means that those who want to sleep should have the chance to do so. During these times it is not permitted to move outside your sub-camp area. Campfires are permitted only in designated areas appointed by the camp security staff. All safety requirements must be met. Each fire site must have a bucket full of water, dry chemical fire extinguisher and if possible, also the fire blanket. There is a professional first aid team and lifeguard in the camp. And also a security team who you will recognize by reflector vests. Every sub-camp has its own leader who is responsible for the order of the sub-camp and bands together necessary teams. Everybody’s contribution is important for camp’s security and welfare! You can leave from the camp territory only through the camp gates and with the permission of your own leader. All people who are coming to the camp and leaving the camp, also all quests, must sign themselves in in the camp gate. It is obligatory to inform the staff about leaving the camp even when you are away only for an hour or two. In case of emergency, follow the instructions of the stuff in duty. All instructions by lifeguards must be followed without argument. 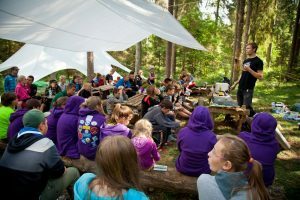 In effect there are all Estonian laws, all good customs and scouts’ and guides’ laws. No smoking, no use of alcohol or drugs! Alcoholic drinks are not part of leader’s cafe program. 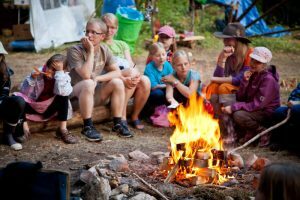 All campers are to follow all camp rules and the instructions of village elders, sub-camp leaders, the camp security staff and the Jamboree headquarters staff. If you do not follow the camp rules, the camp headquarters has the right to send the camper home. But hopefully they do not have to do any decisions of that nature.